In Full Swing, 2011, from Four Sisters, Polaroid SX-70 print, mounted on Impossible Project White Leather SX-70 Polaroid Camera Case, white kid leather gloves (made in France, 1970s). Dimensions: 8.75 in long, 4.75 in. wide, and 1.5 in high. “In Full Swing” forms one small part of the Four Sisters project, work in progress on my intimacies with my great aunts Lis, Trude, and Claire and my grandmother Bert. Each of the sisters’ lives was shaped as in a lost wax process by a Holocaust survival story they would not directly narrate but, instead, transmitted obliquely in the unsaid of affect and translated in a sort of alchemical transmutation through shared practices of pleasure. The scene of “In Full Swing” takes place in the formative queer fantasy-scape of the restored Howard Chandler Christy murals of the naked “Christy girls” on the walls at the Café des Artistes—that grand old haunt of exiles on the upper west side of New York City and now re-opened as the restaurant The Leopard. But this is not a story of nostalgia for a lost world or an in search of lost time that attempts to recreate it. Four Sisters takes its title from Anton Chekhov’s 1900 play Three Sisters which ends with the repeated line: “If we only knew…if we only knew.” Using a technology of documentation that promises knowing, the Four Sisters photographic project refuses, however, to fill in the blanks. Rather, taking seriously the ephemeral and ostensibly minor practices of pleasure through which the four sisters remade their lives— rituals such as always wearing white leather gloves in the street, visiting hotel powder rooms to wash one’s hands with elegant soap, scraping enough savings together to dine in fine restaurants—this work in progress hinges on a renegotiation of the way in which, while suffering may exceed our capacity for comprehension, knowing is not necessarily an answer to finding a way to live one’s life in the wake of trauma. The project is neither biographical portrait nor memoir but, rather, reflects on my own relation to the sisters’ life practices in order to position queer, cross-generational attachment as its own vital technology for forging a life. This project on post-Holocaust forgetting and queer aesthetic survival strategies asks how disobeying the ethical imperative of the "never forget" and the weight placed on photography and first-person narration to always bear witness to trauma might generate its own practical ethics. Pursuing the practice of forgetting as a creative one, Four Sisters explores how the photograph may forge some importantly transformative relations beyond the socially sanctioned--that is, queer cross-generational, trans-age bonds. Each piece in the larger project pairs a Polaroid with story text and a charged material object (white leather gloves, hand-rolled cigarettes, manual typewriters and adding machines, antique furnishings) keyed to particular rituals but also developed gesturally into evocative props of a signature style. Re-activating the outmoded in style, media, and form, Four Sisters pursues an alternate kind of memory practice through image, text, and material object that depends on an enabling negation of the command to produce the expected narrative of trauma. This is a history for the present that is not about knowing but, rather, necessary reminders of the audacious possibility of pleasure as an act of creative survival not just for the survivor themselves but as a relational practice of forging counter-normative affective bonds that enable us to live in the wake of transmitted traumas. Spinster Style, 2012, from Four Sisters, Polaroid SX-70 print made with PX70 Color Protection Film, mounted on Impossible Project White Leather SX-70 Polaroid Camera Case, white kid leather gloves (made in France, 1970s). Dimensions: 8.75 in long, 4.75 in. wide, and 1.5 in high. Spinster Style from Four Sisters. 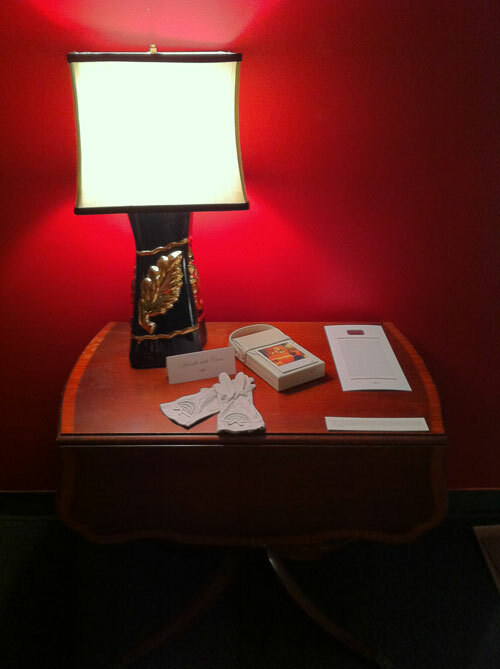 View of installation consisting of SX-70 Polaroid print mounted on Impossible Project white leather case, white leather gloves, text on menu card with original Russian Tea Room logo, and vintage lamp. In “Our House! : Portraiture and the Queering of Home,” curated by Lex Lancaster, Evolution Arts Collective, October 2012. 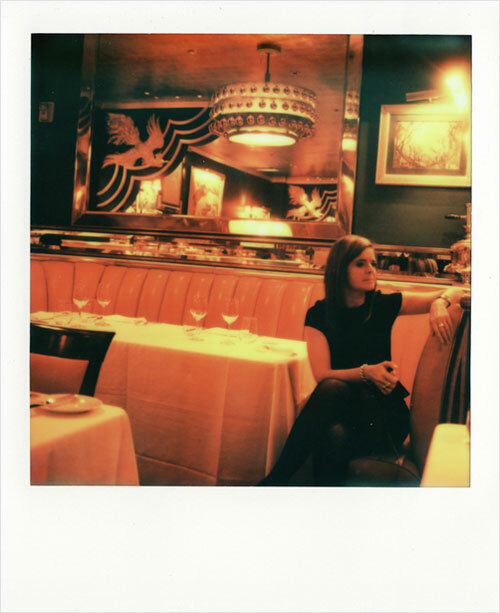 The scene: a table at the Russian Tea Room on East 57th Street in New York City. A warm haven on cold nights when you wish the concert at Carnegie Hall could last forever? An enclave opened in 1927 by former members of the Russian Imperial Ballet? A tourist trap? An over-ornate, gilded refuge for eastern European exiles? An old-school, old-world, overstuffed restaurant with deep red leather booths and a retro menu on which the Cotelette à la Kiev of my childhood, the chicken breast that disgorges butter when sliced is still the featured entrée? Whatever the truth (and it’s probably all true), this was home. Or, rather, my wished-for not-home. The gilded dream palace to which the woman I called my Auntie Mame would usher me at least once a visit. Like the Auntie Mame of fiction and film, my great aunt Lis may not only have promised but also actually delivered on those lines: “I’m going to open doors for you. Doors you never dreamed even existed.” But, unlike Auntie Mame, my great aunt Lis—the Holocaust survivor from Germany who trained to be a French professor but, unable to find employment, supported herself as an accountant instead—was a life-long spinster. And a gourmande. Who paid for her own elaborate dinners (and for mine) with a poor salary and meager savings. Such restaurants where she was led to a table of her own (maybe not a nice one--she was an old woman alone after all--but a table nonetheless) were a kind of home to Lis. And they became an anti-home of possibility for me. In his essay on the secret of Jane Austen’s style, D. A. Miller writes of Style with a capital “S” as a kind of place, “Like the Unheterosexual, the Spinster too resorts to Style, the utopia of those with almost no place to go.” What I learned from the deep pleasures of the table in the company of my great aunt with a gourmandizing palate and fastidious taste was that Style could also make a habitable place for a woman, an old woman, a queer woman alone. Style turned the tables on an unhomely world of places set relentlessly for men escorting their dates to dinner. Style opened a delicious aperture for an aging, queer woman who likes to do her own escorting, who was over-fond and remains inordinately and perversely attached to her great aunt, and who couldn’t breathe but also couldn’t get sweaty breathless without the doors she swung wide with her queer, old Spinster Style. 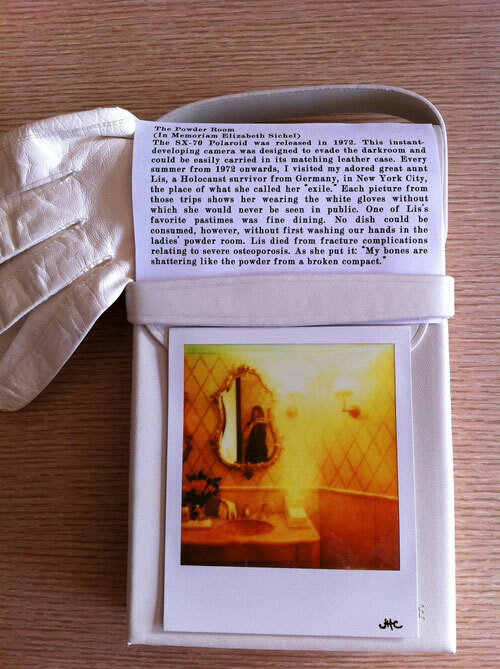 The Powder Room from Four Sisters, Polaroid SX-70 print (PX70 Color Shade film from the Impossible Project), white leather SX70 camera case, text and a pair of vintage white leather gloves. In Ossuary, an installation by Laurie Beth Clark, “Compendium 2012: Art Department Faculty Exhibition,” Chazen Art Museum, Madison, Wisconsin, February 4–April 1, 2012.